Are you looking for a complete guide to Google Analytics for WordPress? If you are a beginner, then you may think that it’s hard to understand and use Google Analytics, but that’s not entirely true. We’ve helped hundreds of our users to implement Google Analytics easily on their WordPress sites. Like everyone else, you can also master Google Analytics and grow your WordPress site. In this article, we’ll share with you the complete guide to Google Analytics for WordPress (with screenshots). Google Analytics is the most popular and most comprehensive website analytics tool in the market. It provides you with useful insights on your website visitors and helps you to grow your business with confidence. 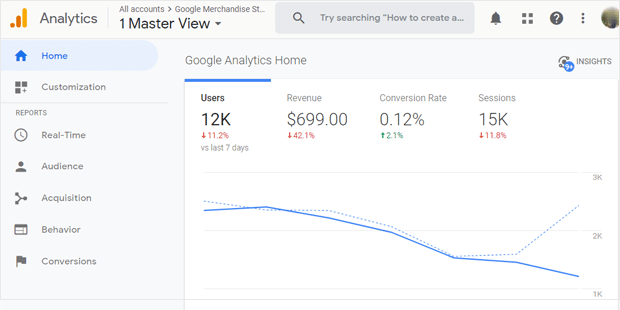 With Google Analytics, you can track who your website visitors are, how they come to your site, and how they interact with your website content. Then by analyzing your Analytics data, you can make data-driven marketing decisions to grow your traffic, sales, and revenue. Location: You can identify the geographical location of your site visitors. Traffic source: You can identify what websites send traffic to your site. Content: You can find the most popular blog posts and pages of your site. eCommerce: You can identify the shopping behavior of your customers and get a report on sales and revenue. When you understand your site visitors, the content they like, and how they find your website, you can tailor your strategy to grow your traffic even more. For example, after looking at your Google Analytics data, you might find that there are a certain day and time when you get the most visitors on your blog. By publishing a new post at that time, you can reach more visitors with your content. Or, you might discover that despite spending hours each week updating your Facebook page, it doesn’t send you much traffic at all. Then you can decide to invest your time in a social media platform that sends you more traffic, saving yourself some time and attracting more visitors. By basing your website strategy on insights you learn from Google Analytics, you can more effectively grow your traffic and save time in the process. Ready to get started? Let’s take a look at how to set up Google Analytics on your WordPress site. To set up Google Analytics on your site manually, you’ll need to copy the tracking code from your analytics account and add it to every page of your site. When the code is placed on your site, Google Analytics starts tracking your WordPress visitors. However, it’s quite an inconvenient method if you’re an absolute beginner. You may need to hire a developer if you don’t have a coding skill. Because you have to edit your theme to insert the Google Analytics tracking code. On the other hand, it’s not a safe process as a small coding error can break down your entire site. Due to these reasons, MonsterInsights plugin was created. 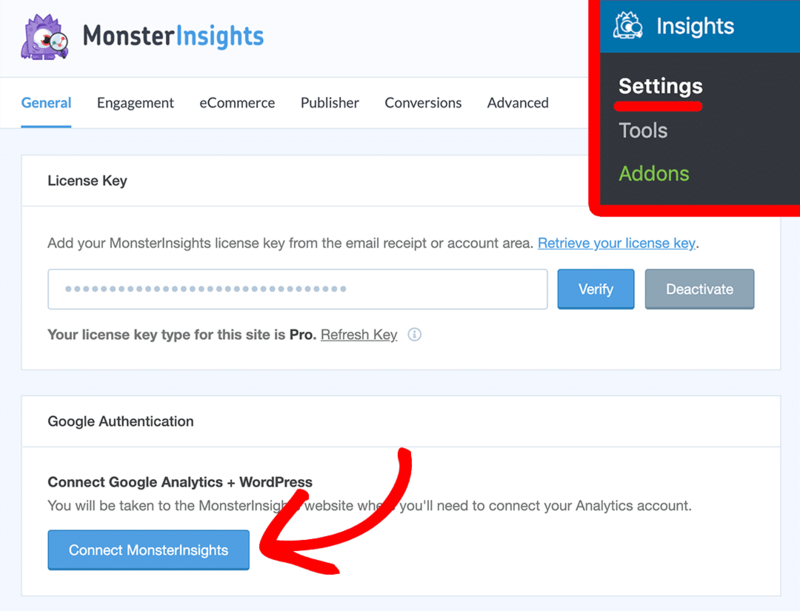 If you’re after an easy solution to set up Google Analytics, all you need to do is to install and activate the MonsterInsights plugin. MonsterInsights is the best Google Analytics WordPress plugin that makes analytics setup easy and also allows you to take the full advantage of various powerful Google Analytics features. The best thing is it lets you connect your WordPress site with Google Analytics in just a few clicks, without even having to touch the tracking code. So, we can clearly say that MonsterInsights plugin method is the best way to install Google Analytics in WordPress. For a step by step guide, you can read how to install Google Analytics in WordPress using MonsterInsights. If you still want to go with the manual method, check our guide on adding Google Analytics to WordPress without a plugin. How to View Your Google Analytics Reports? Upon installing Google Analytics on your site, it can take a few hours to start collecting your website data. Once it starts collecting your website data, you can see your site’s quick overview report in your WordPress dashboard as you log in. The MonsterInsights dashboard widget brings to you the easiest way to see you most important website data at a glance. 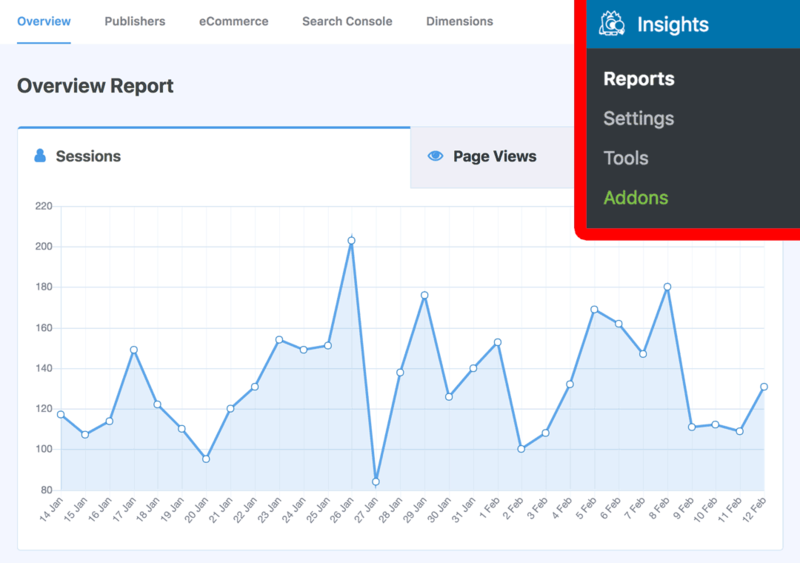 In order to see your complete reports, you need to visit Insights » Reports from your WordPress dashboard. Now you can see all your important Analytics reports presented in the beautiful charts. 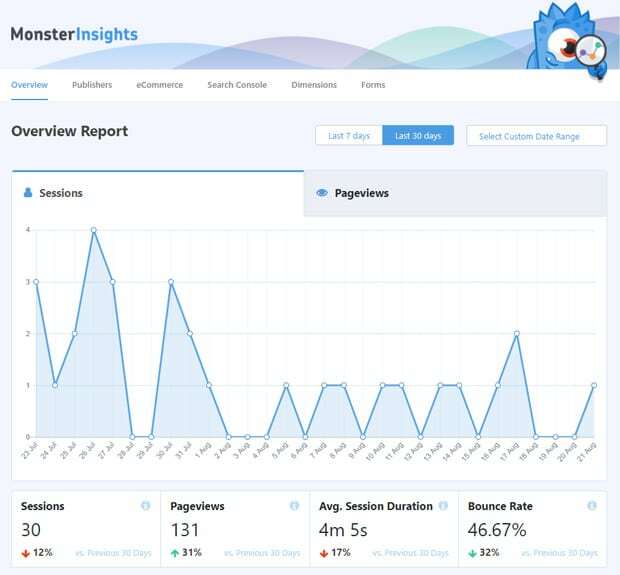 MonsterInsights gives you a quick overview of your entire traffic stats, so you don’t always have to log into your Google Analytics account to get an overview. It’s yet another benefit of using MonsterInsights. If you’ve installed Google Analytics without the MonsterInsights plugin, you’ll need to log into your Google Analytics account every time you want to see your Analytics reports. After you log into the account, you’ll see the Google Analytics home page as shown below. You can click on each of these categories and sub-categories inside them to know your website audience. 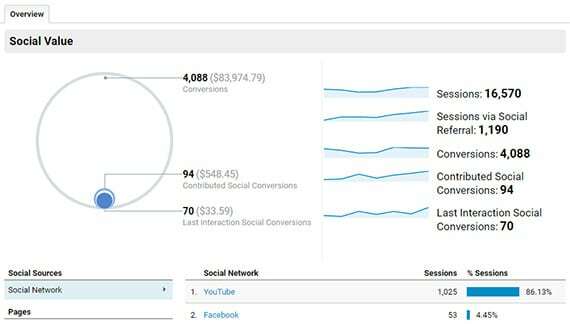 Now that you know how to find your Analytics reports let’s take a look at a few important traffic reports to track and analyze for success. You can find your website’s overview report in your dashboard widget as well in the reports page. 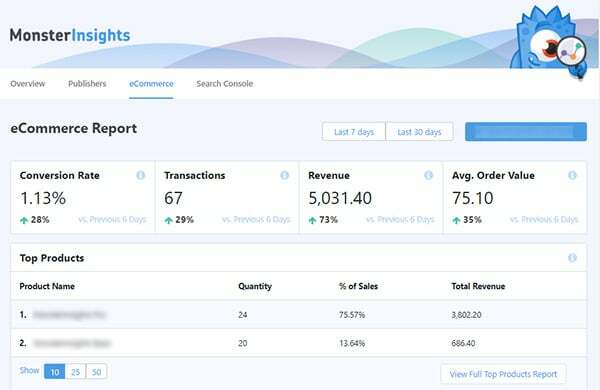 Go to Insights » Reports to open the reports page in your dashboard. Sessions: A session is defined as a group of interactions a visitor takes within a given time frame on your website. In simple terms, whatever a user does in a single visit, like browse multiple pages, purchase products, download resources, etc. is counted as a single session. 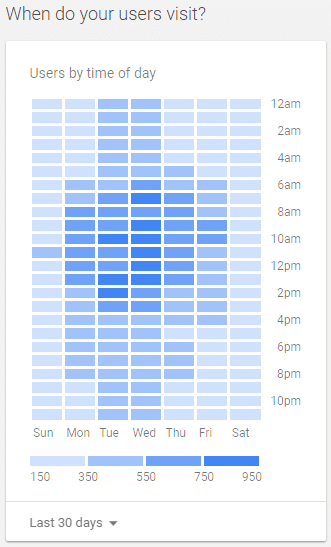 Users: The number of visitors who arrived at your site during a selected date range. Pageviews: The total number of pages viewed. Bounce rate: The percentage of visitors who leave your site after just viewing one page. You can read more about bounce rate in Google Analytics. If you’re offering downloadable resources to your visitors, you’ll need to know if they’re actually downloading them. Out of the box, Google Analytics doesn’t support file downloads tracking. 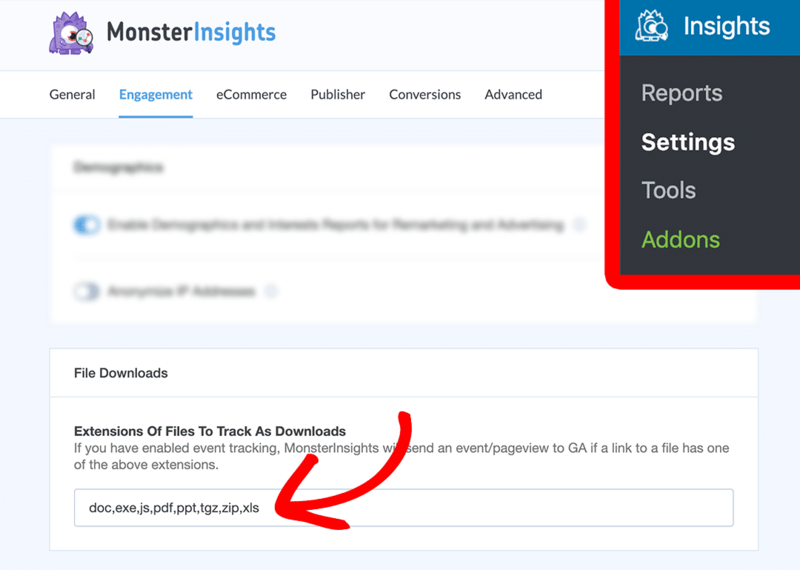 But with the MonsterInsights plugin, you can easily enable file downloads tracking in Google Analytics without having to touch a single line of code. All you need to do is to install and activate MonsterInsights. Upon activation of the plugin, every download will be tracked without any further configuration. To track downloads of more file extensions, you can go to Insights » Settings » Tracking » File Downloads and change the settings. Your email list is the single most important asset of your online business. If you’re looking to grow your email list, you need to optimize your list building campaign and track how well your optin forms are converting. With MonsterInsights, you can easily track form submissions. 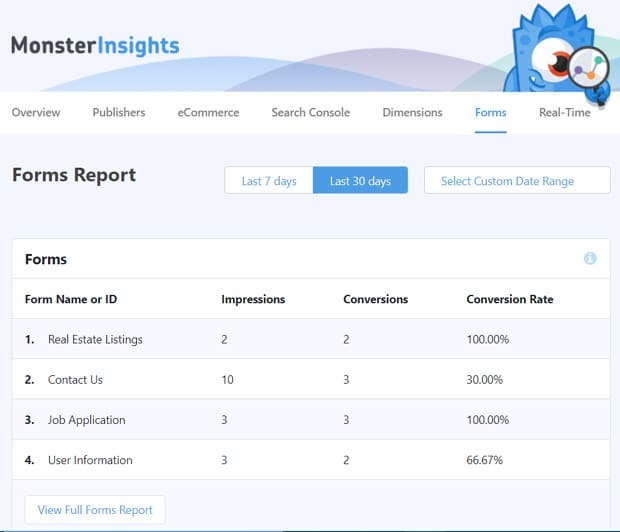 You just need to install the MonsterInsights Forms addon. Once it’s installed, no settings or configurations are required. You can see your form conversion reports by going to Insights » Reports » Forms in your WordPress dashboard. The Forms addon works with any contact form plugin, so it’s easy to see your WPForms and Gravity Forms analytics or any other WordPress form plugin. For more details, see our full guide on how to track WordPress form conversions using Google Analytics. Google Analytics gives you detailed insights into your customers’ shopping behavior. You can easily view the number of transactions and revenue your website generated in Google Analytics. 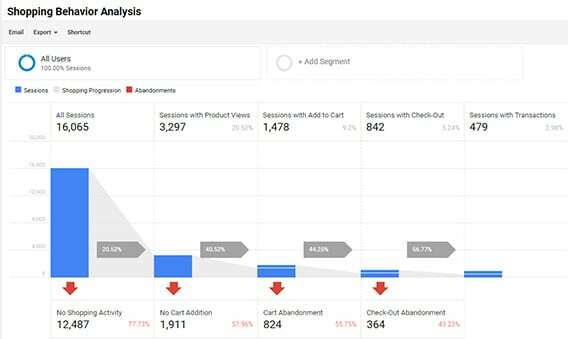 To keep track the performance of your sales and revenue and to make more data-driven decisions to improve your sales, you need to set up eCommerce tracking on your site. With eCommerce tracking, you can easily find various key performance indicators of your online shop such as the number of transactions, revenue, conversion rate, shopping cart abandonment, etc. With the Pro Tier of MonsterInsights, you get eCommerce Tracking right inside of your WordPress Dashboard. You for further details, you can read how to track eCommerce sales in Google Analytics. We hope this beginner’s guide to Google Analytics helped you learn how to use Google Analytics to grow your WordPress website. You may also want to see our guide on 8 Google Analytics Metrics bloggers should track for success.